6 October 2012, (a sunny autumnal) Saturday morning saw the first stage of a community engagement process for an exciting and innovative project to bring Green Streets to Lambeth, which in essence is sustainable drainage in the guise of rain gardens, possibly permeable paving and other green infrastructure (full details yet to be decided). 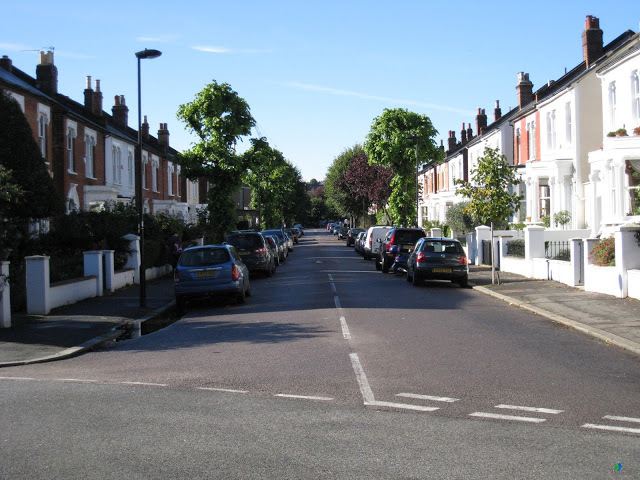 Lambeth Council and Sustainability Engineer Owen Davies in particular is driving forward an approach to deliver retrofit SuDS within the residential streets of the borough. In this (which is one a of a series of related) projects Lambeth Council is working with Sustrans, URS and Environmental Protection Group to deliver Green Streets and see what can be done to better manage surface water, deliver green infrastructure and improve the local street scape in and around the junction between Ardlui Road and Chatsworth Way in SE27 (see pics of the junction, Ardlui Road and Chatsworth Way). 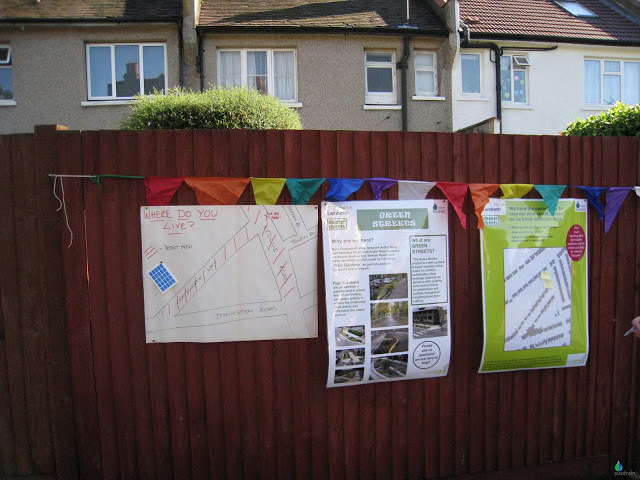 Sustrans are providing support on urban design and community engagement with local residents through their DIY streets and liveable neighbourhoods program. Detailed design support on the SuDS components is being provided by Environmental Protection Group and URS. 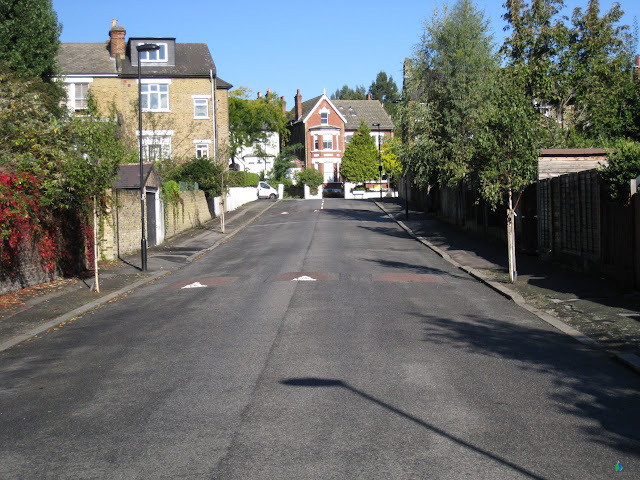 The project was initiated to provide traffic calming and deal with surface water flooding problems lower in the catchment, primarily as a result of pluvial and sewer flooding. 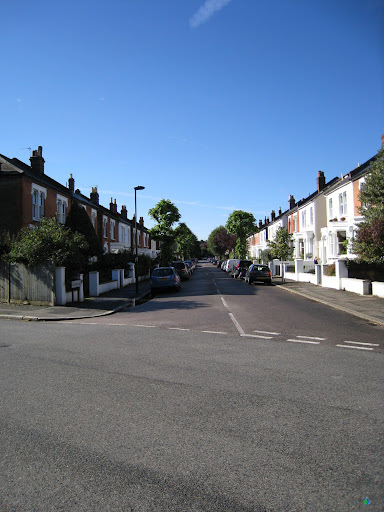 However, Lambeth Council wanted to also exploit opportunities to improve the street scene by delivering green infrastructure and a safer more enjoyable environment for the local residents. Background investigations have included traffic and parking studies complemented by topographical and drainage modelling. 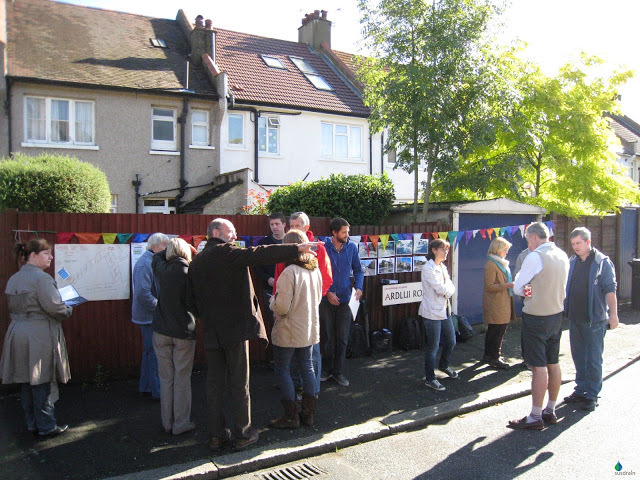 Saturday morning saw the setup of a friendly and informal drop-in zone in Ardlui Road (see below). In the days leading up to Saturday Ben from Sustrans and Owen from Lambeth Council personally delivered flyers to local residents informing them of the project and inviting them to come and chat on Saturday at the drop-in session (see below). From about 11am through to 1pm there was a steady stream of local residents and the occasional passer-by that stopped to see what was going on. The concept of green streets, retrofitting rain gardens and changing the street scene was briefly discussed. This informal (and very friendly) session was an important opportunity for the local community to meet those involved in the project and heralded the start of the process for them to influence how the Ardlui Road and Chatsworth Way junction as well as the surrounding area could be improved. 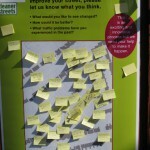 Residents placed post it notes on a map to indicate things they liked or would want considered (see below). 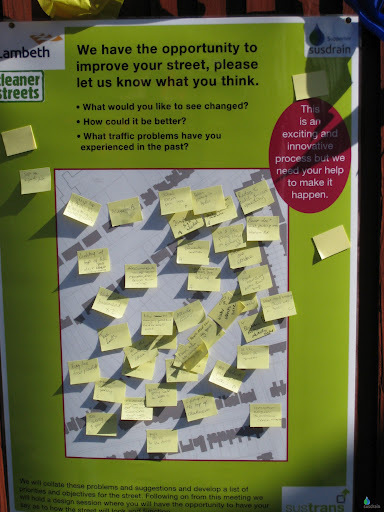 On the whole all responses were extremely positive, welcoming the opportunity to improve the local environment and become engaged and involved in the process. Some of the residents also provided anecdotal information of flooding previously not known and many liked the idea of having a rain garden in their own front garden! One resident coined the phrase of “twiddles” in the road to describe rain gardens and vegetated chicanes. Some concerns were expressed about the impact any proposals may have on parking, potential congestion and the level of disruption caused during construction. However, many of the concerns or challenges posed can be overcome by good design and construction management. This drop in session is the start of a year long process till delivery, and the next phase involves analysis of feedback and a community design session. Which I’ll hopefully attend.